You'll be £14.99 closer to your next £10.00 credit when you purchase Luftwaffe Training Aircraft. What's this? The often unseen and unrecognised element in aerial warfare, is that of training the pilots and crews, yet it its value is beyond calculation. In this fundamental role, a wide variety of aircraft were used by the Luftwaffe, with trainee pilots progressing from simpler, older machines, such as the Klemm 35, the Focke-Wulf Fw 44 and the Bücker 131, to the more sophisticated Arado Ar 66, the Gotha Go 145 and the Arado Ar 76, as well as heavier aircraft like the Junkers W33 and W44. Gradually they would be introduced to newer and faster models that enabled them to experience, to some degree, the type of aircraft they would be flying in combat. Recruits would initially spend six months at a Fliegerersatzabteilung or training depot, where the main emphasis was on drill and physical training, with introductory lectures on the principles of wireless operation and map reading. This would be followed by two months studying general aeronautical subjects, before being sent to elementary flying school. The various kinds of aircraft used for training depended upon the role each individual trainee would eventually undertake, from single-seat fighters to multiple-crew bombers or transports. For example, those men ear-marked to become bomber pilots trained on early versions of He 111, the Ju 52, Ju 86 and the Do 17. In this, the Luftwaffe was also able to make use of captured enemy aircraft. It also established training units through the Occupied territories to enable its trainees to familiarise themselves with different conditions and terrain. 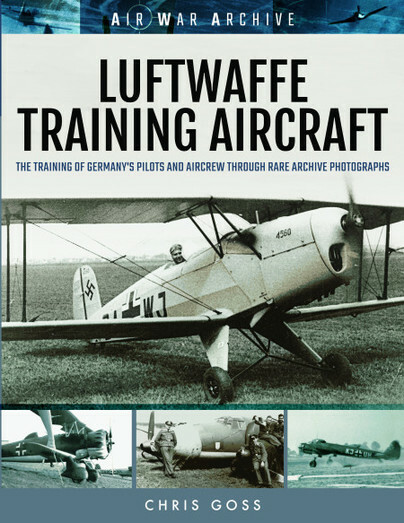 In the less-pressurised environment of the training schools away from the front line, more care could be taken over photography, resulting in the author of this extensive study of the wide range of aircraft used for training by the Luftwaffe, being able to assemble such a fine collection of excellent images. A book that, due to its huge amount of photos, details, information and interest, cannot be missing from the bookshelves of a fan of the air war in the Second World War. The intro gives some background context, and the glossary is very useful. An easy book to recommend for Luftwaffe historians as well as modellers. Loads of fascinating archive images and modellers I think will like this one for the detail that is shown in the photos and the large number of pictures which can inspire some great diorama ideas. Having retired from the RAF with the rank of Wing Commander, Chris Goss is a regular and highly sought after contributor to major aviation publications in the UK, France and Germany, as well the author of fourteen critically acclaimed books covering the air war between 1939 and 1945. Chris completed an MA with Merit in War Studies in 2001.